"Edinburgh Knowledge Cafes, February 2011" - David Gurteen's Flickr stream. 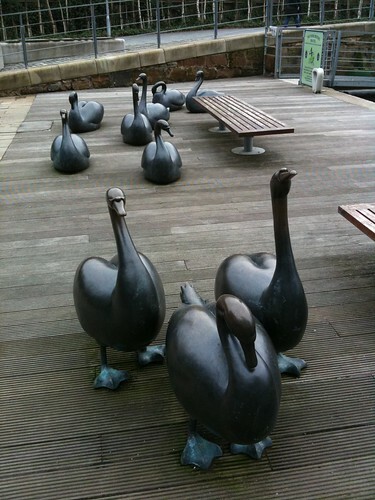 Image description: A group of statues of swans, in various poses, gathered around two flat wooden benches. Used under a Creative Commons licence. We will be in the casual bar area. Anyone in Melbourne and up for a meet-up some time between 6 and 10 January (inclusive)? Now calling for suggestions as to time and location! bluebec has suggested around the Fairfield Boathouse for a picnic, or, alternatively, The Great Northern Hotel in Carlton for dinner. If you’re interested, please let me know your thoughts, either by commenting here, emailing me at tamar [dot] jo [at] gmail (you know the rest) or on twitter, where I am @jotamarwallaby. As always, there’s no level of existing involvement required, whether here at Hoyden About Town or in the femmosphere generally. Creators, commenters, lurkers, newcomers and familiar faces all welcome, as are friends, partners and children. bar area can be accessed via the restaurant. Easily accessible from several tram lines. Price: You should be able to get a light meal + drink for around $15. Possibility of a general kitty. you might bring (all are welcome ). Ok, sounds like morning/lunch-ish on Sunday 8th January might be best, based on Kite’s & Merinnan’s restrictions and my assumption that we have a critical mass of people who work Mon-Fri. If you have an objection to this time, please let me know (you are welcome to use email or twitter if that is better for you). Also, just to confirm: cheap is definitely a criterion for choosing a location, as are accessible (both re wheels and public transport) and child-friendly. Casual pubs are often quite good for all of these things (although some are not great with the accessibility side). At the moment, the BOM is predicting that it will be warm and humid with a little rain, so I’m not sure that choosing a picnic venue will be the best option. So, unless anyone has any other suggestions, I’m thinking that the Great Northern Hotel in Carlton might be a good bet. It is pretty good for public transport, being between Lygon St and Nicholson St (it’s on the corner of Rathdowne St and Pigdon St); the food looks decent and not too expensive, with vegie options and some cheaper food (especially if people just want a snack), such as chips or sharing a pizza; and as a pub with a bistro and beer garden, it is hopefully relatively child-friendly. I am going to call them when they are open to ask about kids, accessibility, opening times and group bookings. Meanwhile, any information about any of these things would be great (especially if anyone knows it is definitely not wheelie accessible – this would take it off the list completely). AND/OR please let me have any other suggestions. (Hope this goes without saying, but it does not have to be somewhere that serves alcohol.) I’m thinking a dumpling place could be another option, but all the places that come to my mind have stairs. I’m happy to call around a couple of places and ask about accessibility, group policy/bookings, kids and opening hours, but if you have a place in mind and can answer those questions (or make the relevant call), even better! I use the Great Northern in Carlton for a monthly bisexual discussion group, it’s certainly queer friendly, I’ve seen children in it and they have a nice big outdoor area (which is weather dependent). I don’t recall if it is wheelie accessible – it was one of the few venues we could find with a free private room for a discussion group. @Mary, yes I (plus daughter plus friend) will be at the Girl Geek Dinner on the 14th. The Parkview Hotel in Fitzroy North is a friendly and reasonably priced venue that would be open then, but I can’t remember if it’s wheelchair-accessible. I’ll see if I can find their number and give them a call in the morning. Mary – thank you, I didn’t know about the Geek Girl Dinner! Now to see if my sister wants to come along to it with me! yes, I would love to come and would be much more likely to make it if it’s not outside in hot weather. She then said she was new, and unsure, and would get the boss to call me back, but I don’t have high hopes. Merinnan, thanks for that suggestion and for making the call; fingers crossed they are a bit more useful than the GNH! Thacky, would a shaded beer garden be acceptable? (might actually be cooler than an inside area if it’s muggy) No worries if you would prefer to be inside, but please let me know for booking purposes. To be clear: if I booked a table outside, it would be on the condition that it would be in full shade at all times. Should add a note on the Girl Geek Dinner now that I’m using a non-phone keyboard: it’s not an either-or thing and no one needs to choose! Just thought it might be an additional event of interest to some Melbourne readers. Do say hi if you come along. I won’t be in Melbourne early enough for Jo Tamar’s meetup (flying down on the 13th, will be at AdaCamp, GGD and then linux.conf.au in Ballarat) but I hope much fun is had! Like Mary, I won’t be in Melbourne for AdaCamp until the 13th, so I can’t make Jo’s meetup either, but I will be going to the Girl Geek Dinner on the 14th, and I’m taking my daughter and her school-friend, who are doing other things around Melbourne while I’m at AdaCamp and then just joining us for dinner. I’m looking forward to meeting different people at the dinner who aren’t part of AdaCamp, and generally seeing what a Girl Geek Dinner is like, because I keep on having good intentions about going to one in Sydney but haven’t managed to get myself that organised yet. I shall keep looking – I know I’ve been to wheelchair-accessible places before, I just can’t remember which ones they are! The only places I can think of that have wheelchair access are Brunettis in Carlton (outside seating under cover), The Shanghai Noodle House (though it’s a really small place), or Vegie Bar (there’s a large step into the cafe but it has seating outside, not under cover). I haven’t been to many of these venues, so can’t comment on them further. Oh, really, in the shade should be fine – just do what you can and I’ll deal with my embarrassment about being sweaty and uncomfortable in public! Thanks for taking my concerns so seriously! Sorry for the radio silence – been having computer issues. They have a restaurant area and a more casual bar area – the latter will be better for us, as the restaurant is table service & so might not deal so well with people coming and going or not ordering food. The bar area can’t be booked, but I’ll aim to be there by 11.30 to reserve a table. If a couple of other people are able to come at that time to help save space, that would be greatly appreciated. So, just a run-down: wheelchair accessible (plus accessible toilet! ), except the bar itself. So to any wheelies, I’m sorry, you will have to rely on a pedestrian to order. I hope that is ok (I figured it was better than some of our alternatives). Kids are welcome, if supervised, but please be aware there are no high chairs. Price: it’s a bit more expensive than some of the others but you should be able to get a light meal + drink for around $15. What we have done in the past in Sydney is to have a bit of a kitty, even if only for shared items. I’m more than happy to throw in a bit extra for that purpose, especially if it means someone might come (and be able to relax) who might otherwise not have done. Please let me know if you think you might come along, as well as any extras you might bring (all are welcome ). I’m planning to come along. Thanks for all the organising, Jo. Looks like it’s going to be a great turn-out 🙂 I’m looking forward to meeting you all. By the way, one more thing – this probably doesn’t need saying but might make some people more comfortable about coming along: please respect pseudonymity. In other words, people who use pseudonyms online may introduce themselves to you using (something approximating) their real name. Please continue to use pseudonyms for such people online, including but not limited to facebook tagging. For that matter, photos only with permission, and uploading of photos only with permission. Thanks! I’ll be there, too – look forward to meeting you-all. Thanks for organising! Oh, luck failed me again. Just looked at computer for the first time after a week in the wilds. Won’t be making it into the CBD within the next few hours. Have a great time and hello to everyone! Thanks for organising this, it was great meeting everyone! And likewise: thanks to everyone who came along. It was a pleasure to meet you all.